HumCommerce is a premium E-Commerce Conversion Rate Optimization (CRO) tool. Convert more Website Visitors to Buyers! Heatmaps - Where do visitors click? Session Recordings - What do visitors do? A/B Testing - Discover converting designs. Conversion Funnels - Optimize your conversion funnels. Form Analytics - Reduce form abandonment. Boost conversions on your website with this E-Commerce CRO tool for just $49. Awesome Reasons To Buy This E-Commerce CRO Tool Deal today! Packed with premium features, HumCommerce is one of the best e-commerce CRO tools that you can use to boost sales on your e-commerce website today. 1. 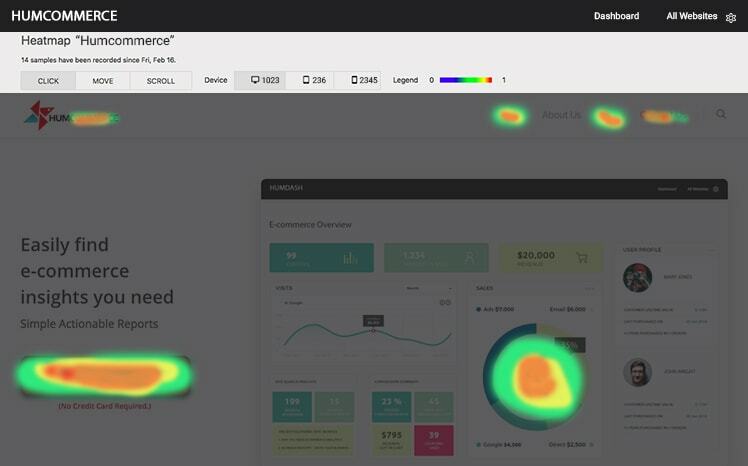 Heatmaps: Where are your visitors clicking? 2. Session Recordings: How do your visitors navigate your website? 3. Users Flow: How do your users flow through your conversion funnels? See the path visitors take to navigate your website. Are your visitors going where you want them to go? Optimise user flow using visual reports. 4. A/B Testing: Which design converts better? 6. E-commerce Conversion Funnels: Setup and Optimize your funnels for more sales and conversions. 7. Conversion Attributes: Detailed analysis by channel to optimize sales performance. 8. Custom Reports: Need custom reports? Build your own! Create custom reports to find exact insights you want to see. Pull data from a wide range of reports: e-commerce activity, visitor logs, website engagement metrics and more. This deal includes Lifetime Access to Pro Plan. Updates for a lifetime will be covered. Lifetime email support will be provided. Convert Visitors To Buyers Today With This E-commerce CRO Tool! Buy HumCommerce Tool At A Price Of $49 Only! This deal tool is only for one website or multiple ? Hi Suffian! Yes, The HumCommerce tool supports multiple websites. The only difference in the plans is the number of page views/month & recordings. This is one of the best softwares I’ve bought. Very robust, easy to use and gives you tons and I mean tons of information on your site and visitors. The heatmap and recordings alone are worth waaaay more than anything you get from anything else. Don’t miss out on this deal. It’s a winner for sure. Thanks, Humcommerce!! May I know this deal stackable? If 1 purchase 5 deal, do I able to get 150k page view and 2.5k recording? Unfortunately, this deal is not stackable. How many sites could I monitor with this deal? The copy states this is the Pro account – which in the vendor site state is limited to 10 sites. Is this the same limits for this deal…or do we get unlimited sites as the agency? Is there any way to stack multiple deals to get the Agency account? 1. This is a special deal for DealFuel where you can add unlimited websites but the views are limited to 30,000 per month and recordings are limited to 500 per month across all websites. This software looks good. Can purchases be stacked? One of best purchases from DealFuel. Love the heatmaps. Would be great if we can stack to increase limits or offer a higher plan. It can be multi language? How many pageviews a month are included? Can you please specify the plan we get? How much impressions, how many domains and so on? Very low information about the deal details is written there. You get 30,0000 page view a month, unlimited websites and 500 videos per month. which plan is it here? Till when is this deal available? Incredibly useful software to help improve my e-commerce site. I have changed some navigation elements or graphic elements on my site, thanks to this type ofr analytics, for better conversions. Thanks for this deal ! It is a great Hotjar alternative and it’s a steal at this price. HumCommerce is more appropriate for ecommerce sites but I have been using it on my B2B sites and heatmaps & recordings are helpful to improve the CRO. Thank you! One of the best lifetime deal for e-commerce sites.